Lots of products are affected. OTTAWA — Canada will impose retaliatory tariffs on up to $16.6 billion worth of U.S. imports in response to the American decision to place similar levies on Canadian-made steel and aluminum. The Canadian tariffs, which go into effect July 1, cover a broad range of items. Some, mainly unfinished iron and steel products, will be hit with a 25 per cent tariff, while others, including many consumer products, will be tagged with a 10-per-cent duty. Here is a list of some of the affected products, which run from industrial metal bars to gherkins, whiskey and felt-tipped pens. - Iron and non-alloy steel in ingots or other primary forms, including semi-finished products, flat-rolled products, bars and rods and wire. - Stainless steel ingots or other primary forms, including semi-finished products, flat-rolled products of stainless steel, bars and rods, angles, shapes and sections, and wire. - Other alloy steel in ingots or other primary forms, including semi-finished products, flat-rolled products, bars and rods, angles, shapes and sections, hollow drill bars and rods, wire. 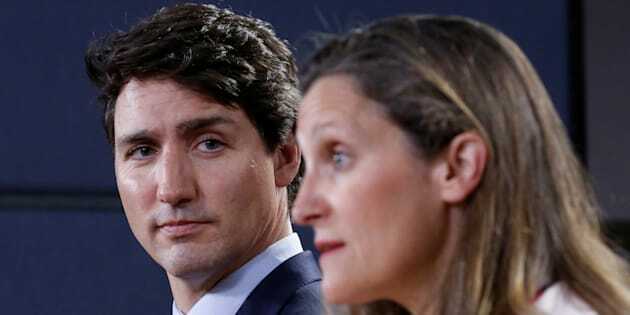 PM: 'Insulting' To Say Canada's Steel Is A Security Risk To U.S.
- Tubes and pipes, sheet piling, railway or tramway track construction material, pipe for oil or gas pipelines, casing or tubing used in drilling for oil or gas. - Food products, including yogurt, roasted coffee that is not decaffeinated, prepared meals of fowl or beef. - Sweets, including maple sugar and syrup, licorice candy, toffee, other sugar confectionery, including white chocolate, not containing cocoa, other chocolate in blocks — slabs or bar, filled or not filled. - Other foods, including pizza and quiche, cucumbers and gherkins, jams, jellies, strawberry jam, nut purees and pastes, berry purees, and other fruit purees other than banana puree. - Condiments, including soy sauce, tomato ketchup and other tomato sauces, prepared mustard, mayonnaise, salad dressing, mixed condiments and mixed seasonings, other sauces. - Soups and broths, mineral waters and aerated waters, containing added sugar or other sweetening matter or flavour. - Personal grooming products, including manicure or pedicure preparations, hair spray, shaving and after-shave preparations, soaps and other skin washing products. - Household products, including room deodorizers, automatic dishwasher detergents, candles and tapers, other than those for birthdays, Christmas or other festive occasions; glues or adhesives sold in containers of under a kilogram, tableware and kitchenware, plastic household articles and hygienic or toilet articles, of plastic, toilet paper, handkerchiefs, cleansing or facial tissues and towels, tablecloths and serviettes, printed or illustrated postcards or greeting cards. - Hardware products, including insecticides and fungicides in packages under 1.36 kg each, plywood (other than bamboo), veneered panels and similar laminated wood. - Other steel or iron products, including beer kegs, or parts for stoves, ranges, grates, cookers and barbecues. - Aluminum bars, rods, wire, sheets, foil, tubes and pipes and pipe fittings, most aluminum structural pieces, aluminum reservoirs, tanks, vats and similar containers, including tanks for compressed or liquefied gas. - Aluminum kitchenware, including tables, scouring pads. - Appliances, including refrigerator-freezers fitted with separate external doors, instantaneous or storage water heaters, washing machines. - Miscellaneous items, including lawn mowers, electrical boards, panels, consoles, inflatable boats, sailboats, motorboats, mattresses, sleeping bags and other bedding, playing cards, ball point pens, felt tipped and other porous-tipped pens and markers.